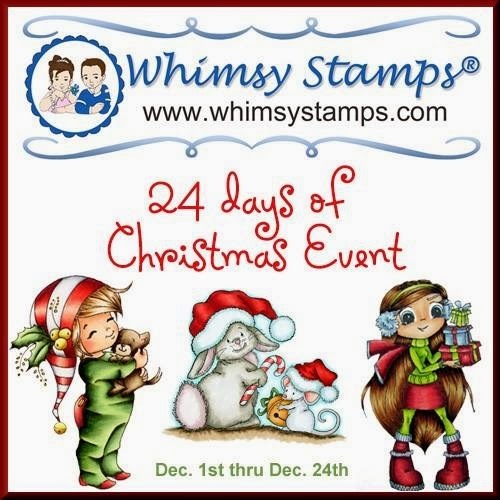 Have you heard yet about the exciting 24 days of Christmas Event we are holding at Whimsy Stamps? Every day this month until December 24th, one or more of the Design Team members will share a new creation with you on the Whimsy blog, as well as a letter each day. After you have written down all 24 letters, you will need to unscramble them to make a 4-word phrase and you can email the phrase to Whimsy Stamps to be entered into the grand prize drawing. That is not all, there will also be some random winners during the month, but we don't know yet which blogs or when they will be chosen from, so to maximize your chances of winning, you should leave comments on both the Whimsy blog and our own personal blogs. Today is my turn to share some Whimsy Christmas Inspiration with you! 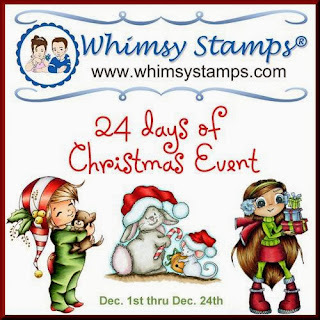 Be sure to visit the Whimsy blog to collect your letter if you'd like to play along in this event. I had some time to create two cards for today's post. The first one uses the gorgeous stamp "Lissy's Little Light", which is from the latest release. Hadn't had a chance yet to use it, so I decided to use it for today's post. She's been colored using copic markers and then cut out. I found the music sheet paper in my stash, I did use some distress ink along the edge, and stamped one of the "lavish flourishes" stamps in the top left corner. The sentiment is from the set "Holiday Cheer" Thought it would be perfect to use with the image. As you can see, I used the same flourish behind the sentiment too. Embellished with some ribbon and gold cord, glitter and the diecut "holly and berries" using Whimsy's die. 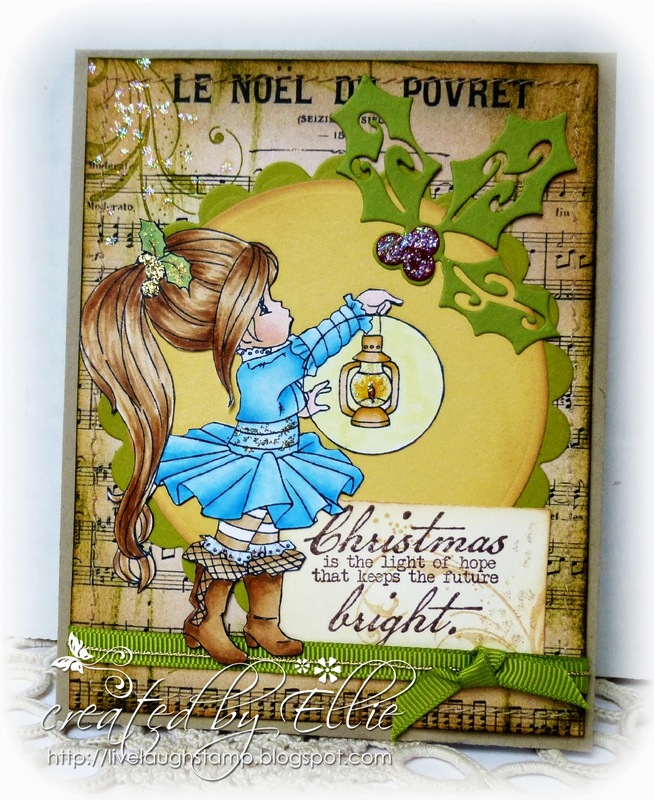 For my second card I used an older stamp set, illustrated by Crissy Armstrong - Peace on Earth. This set includes several beautiful images, including a gorgeous angel, and sentiments. One of my favorite non-cute sets! The image above has been colored using copic markers. 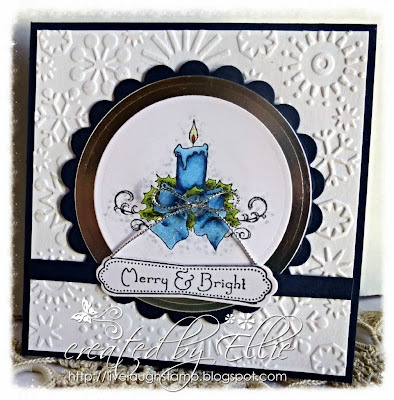 The sentiment is from the set "Holiday Notables 2", and cut out using the Notables 2 die. Embellished with glitter, a clear button and silver cord. Don't forget to stop by the Whimsy Inspirations Blog to collect your letter, and to leave a comment there too for more chances to win. Both of your cards are beautiful. The coloring, the elements and background papers used are perfect. such a beautiful cards! I love the music sheet paper on the first! Hi Ellie...Happy Holidays and I love these cards....Especially the candle my friend!! Lovely creations. Love the layers on the first one and the embossed backgrond on the second one. And the coloring is gorgeous. Congrats!!! Beautiful cards, Ellie! Fantastic coloring and designs on both! Your cards are so beautiful. Love them. These are both beautiful creations. Both of these cards are absolutely gorgeous. and your coloring is simply stunning. Perfect cards and love the embossing and colours of the candle and Lissy is just super cute with perfect colouring thank you for sharing. Hello Ellie, I came here from the whimsy blog. I love your cards, different style but both great. Love the colors you have used on the Elisabeth Bell image. Beautiful and well colored! Love both images! Love love love both cards. You are amazing!! I love the sweet image and lovely sentiment on your first card and the image on your second card is gorgeous too. Such wonderful colouring! Your cards are both gorgeous. I am partial to the top one - I love the sentiment! And the sheet music background is perfect. Wishing you a day of joy! Both cards are gorgeous, that Lissy's Little Light image it's adorable. Two very different cards, but both gorgeous. These are gorgeous Ellie! What an adorable image and love the sentiment on the first card. The embossing that you've don on the second card just makes the image pop. Love the colors you used. Thanks for sharing both these cards and for the amazing inspiration!! Love your coloring and how your choise of papers highligts the image/ blue coloring. You've made two beautiful cards here Ellie. I love Lizzy's little light and the music background you've used in your first card. Your first card showcases my fav "new release" image of Elizabeth Bell! I love what you did with it too! I also like the simple elegance with the candle card also! Oh wow! Gorgeous cards! I especially love the first one. I'm impressed! Two awesome Christmas cards, great shading with the Copics and you cut the image out so perfectly! Love Lissy beautiful golden locks and the lovely blue you have used on Chrissy candle. What a gorgeous and beautiful cards. Wonderful colouring and such great festive cards. Lissy is such a sweet image, love it! Great cards! I LOVE both of your beautiful card. Each one has its own wonderfully creative look. Both cards are lovely, but I really love the look of the first one. The image is wonderful and colored so nicely. And the layout and finishing touches just make the card even more lovely.